Ok guys, I actually got creative the other day. I had some strawberries that were calling my name from inside my refrigerator and I just couldn’t help myself!I had to reach in, grab those bad boys and give them the love that they needed. Because we all know that strawberries are full of love to give!! Who doesn’t love muffins? I’m a big muffin fan, but obviously the tops of those lovely things are where it’s at! Crunchy, soft and sugary…ugh, yum! So, hence these Chocolate Strawberry Muffin Tops were born. But since I don’t have one of those fancy muffin top pans, I improvised! I baked them in lovely little mason jar lids! You guys, it was awesome! I’ve seen so many people lately baking in mason jar lids that I figured why not give it a shot! I was so nervous that they wouldn’t turn out, BUT THEY DID! Yeah buddy! To top it all off, they are super moist and delicious! I have all my favorite parts from a muffin in one spot! Moist muffin with a crunchy streusel topping, sprinkled with sugar crystals and drizzled with a vanilla glaze. How does that not make your mouth water? Well it does mine and I’m eating them so I guess at this point until you are able to full feel the effect that is these Chocolate Strawberry Muffin Tops that you will just have to trust me! I don’t lie people. But it does help that I had some impartial taste testers that loved them as well, so that’s always nice to have the extra reassurance! Now if you do happen to own a muffin top pan, please feel free to use it! The recipe will still be the same, just not in mason jar lids. But come on, the lid part is half the fun of these delicious little treats! 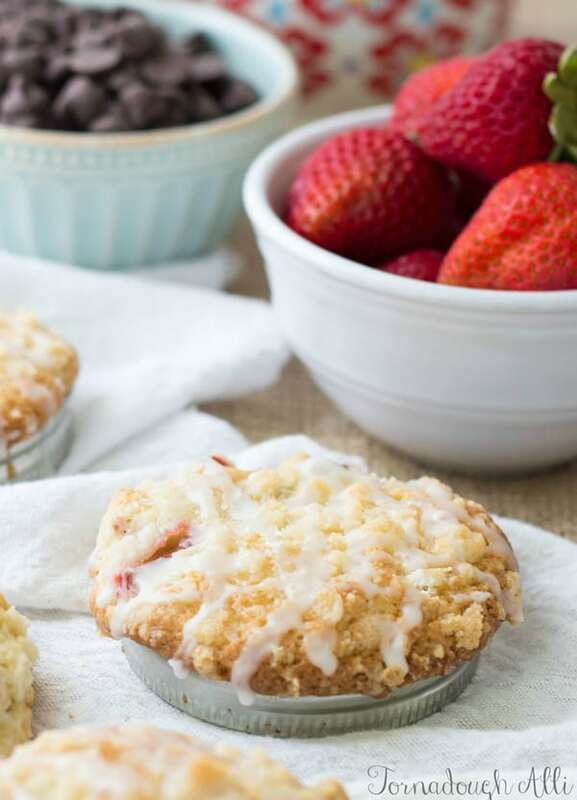 You can switch up this recipe to your favorite muffin flavors, blueberry sounds super good to me, but I was in a strawberry chocolate kind of mood this time around! Using 12 (8 oz) mason jar lids, turn the metal piece so the plastic rim is facing down. Spray inside and out with non-stick cooking spray. In bowl mix together your butter, milk, egg and vanilla and set aside. In another bowl mix together your flour, sugar, baking powder and salt and stir until combined. Stir in your milk mixture until blended. Fold in your strawberries and chocolate chips until evenly distributed. To make your streusel topping combine all ingredients until crumbly, set aside. Distribute batter evenly among mason jar lids making sure too not fill too full or it will overflow which is fine, but makes them harder to remove from lids. Sprinkle each with streusel topping and sprinkle with decorators sugar. Bake in preheated oven for 35-20 minutes or until golden brown and they spring back when touched. 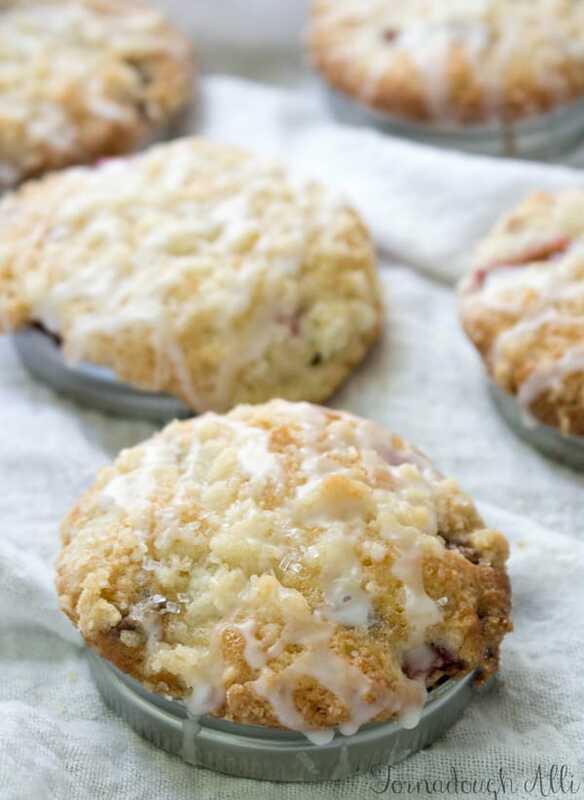 To make your glaze combine all ingredients in small bowl and whisk together, drizzle over tops of muffin tops. Yes please! 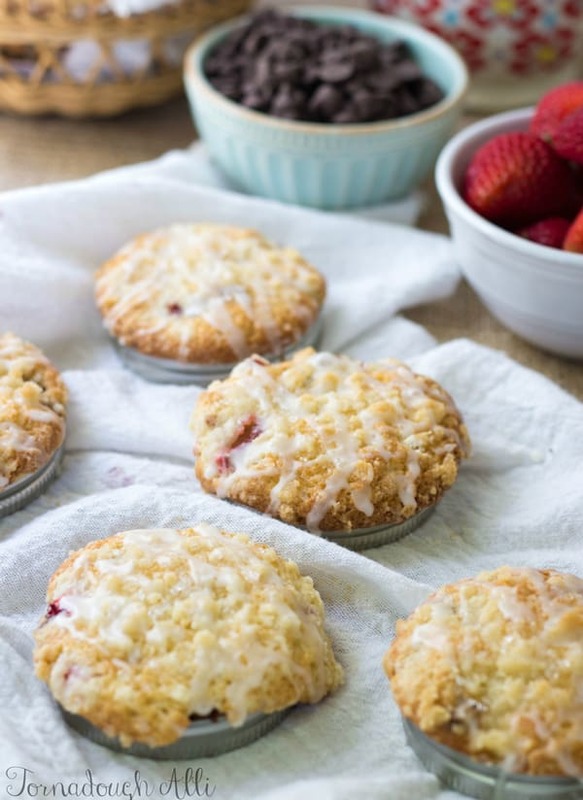 I adore the idea of baking these in lids! Brilliant! The flavor combo sounds so tasty. I have always favored muffins. Thanks for a terrific recipe. And for sharing with us at Weekend Potluck. Thanks so much for hosting! These were so fun to make and the chocolate and strawberry combo was delicious. These are totally adorable! And they sound super tasty 🙂 Thanks so much for sharing! 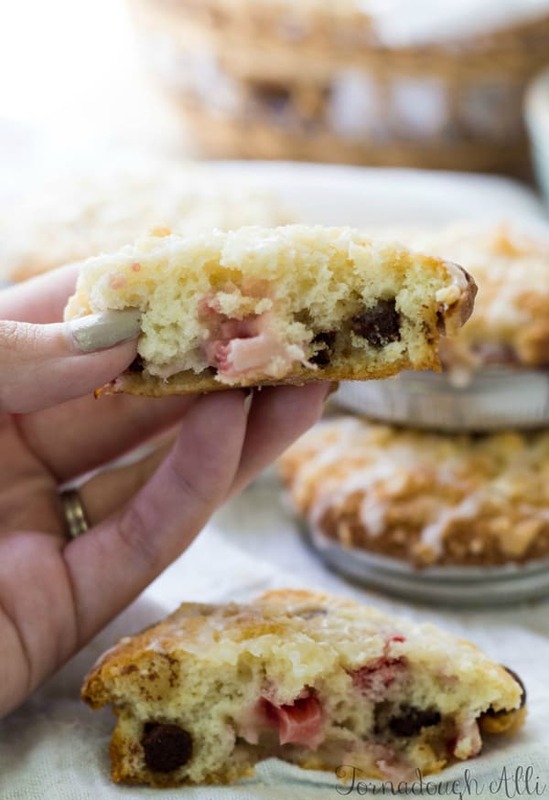 Love these….it is the best part of the muffin,,,,this way you can have 2 of these instead of one muffin…..does anyone know how to make sure they come out of the moon lid instead of sticking ?….. Thanks so much!! I liberally spray my lids outside and inside with non-stick cooking spray. The good thing is that the little tin pieces around the lid are not attached so I push them out with that. Some may crust over the side but usually it’s good releasing and if you don’t overfill not much will spill over. But cooking spray or butter or whatever your choice of greasing agent is highly recommended. Sorry not moon lid, meant to say MASON LID……. How cute are these? I love anything that involves mason jars. The combination of strawberry and chocolate sounds really yummy, too. What a great idea to use mason jar lids to make muffin tops – how creative! 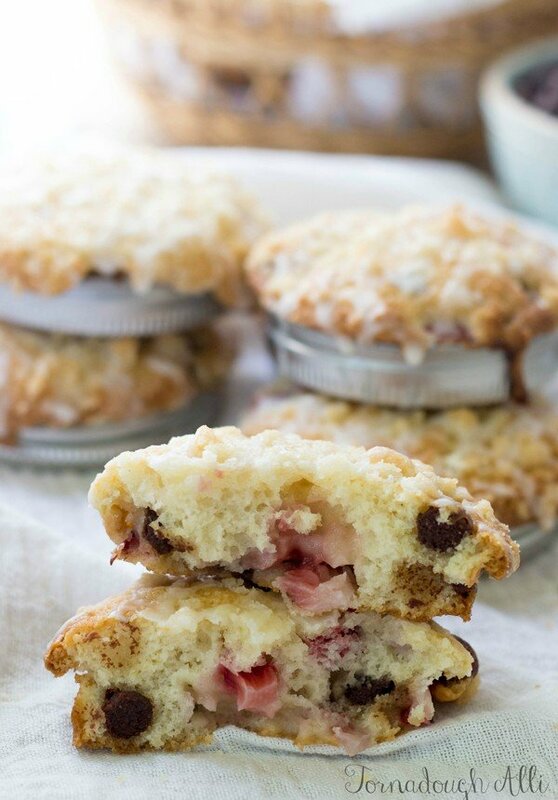 The chocolate strawberry combination is already enticing enough, but that streusel?! YUM. Thanks so much. I had to work with what I had and I said why not. 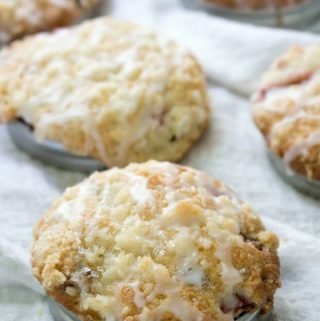 And everything is better with streusel! I agree baking in the mason jar lids are half the fun 🙂 the chocolate strawberry muffin tops look delicious. These sound delicious! I can’t wait to try them. I am assuming that you meant 1 cup of strawberries, not 1 tsp. You can’t go wrong with chocolate and strawberries! Ahhhh thank you so much for pointing out my error in the recipe Sheri! I have it changed now! And thank you so much for your kind words, I hope you do try them, we loved them and they were fun for my kids! If I needed to just use choc chips, would there be any other adjustments needed to the recipe? Thank you! Hi Joy! The measurements should be able to stay the same. Maybe just a few more minutes of cook time, otherwise just add more chocolate to compensate.